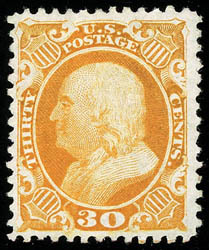 1857-60 (1875 Reprint), 30¢ yellow orange, without gum as issued, a truly outstanding example with huge margins and perforation well clear of the design all around, rich radiant color in bright paper, an Extremely Fine jumbo, one of three examples awarded this grade with none higher; with 1985, 2004 & 2015 P.F. and 2015 P.S.E. certificates, the latter Graded (XF 90J, SMQ $10,000) . THE FINEST EXAMPLE OF THE 1860 30¢ REPRINT ISSUE IN EXISTENCE. A search for the other two "90J" graded example shows that both these examples have perforations that are touching or slightly into the design at bottom. This example is by far superior with margins well clear of the design.